As a result of recent enhancements, and perhaps ultra-low mortgage rates, the Home Affordable Refinance Program has actually made a meaningful impact. Last month, there were a total of 98,885 HARP refinances recorded by the FHFA, which accounted for nearly 24% of all the Fannie Mae and Freddie Mac refis during August. That’s a big chunk of the business, and represents nearly a quarter of the 400,000 total HARP refis originated in all of 2011. Since January, 618,217 loans have been refinanced via HARP, bringing the all-time total to 1,640,068 (the program began in 2009). A total of 1,292,932 HARP refis have been for loan-to-value ratios between 80 and 105 percent, and another 228,666 were for refis between 105-125%. Last month, a total of 26,944 loans refinanced through the program had a loan-to-value north of 125%, which was one of the major program enhancements announced in late 2011 and implemented in 2012. In fact, fewer borrowers (23,265) with LTV ratios between 105-125% refinanced through the program in August. Simply put, the program is reaching the hardest-hit borrowers out there, many of whom you would assume are “too far gone” to benefit from such a program, let alone any program. After all, if you’re underwater on the mortgage by more than 25%, it might be looked at as a losing endeavor, especially if it doesn’t involve any principal forgiveness. But these numbers show there are believers out there, even in the darkest of times. For all of 2012, 118,470 borrowers with LTV ratios greater than 125% have taken advantage of HARP 2.0. And the overall numbers also appear to be picking up. Last month, 99,000 HARP refis were recorded, up slightly from 96,000 in July. Assuming the numbers held up in September, we’d be looking at quarterly figures around 300,000. That would be significantly higher than the 243,000 refis in the second quarter, and well above the 180,000 executed in the first quarter of 2012. Additionally, the last two months’ totals have also surpassed the quarterly numbers seen in the last three quarters of 2011. Somewhat amazingly, 18 percent of borrowers with LTV ratios above 105% chose to refinance into shorter-term mortgages, such as 15- and 20-year fixed loans. The rest went with the traditional 30-year fixed. This compares to just 10% in 2011. In other words, borrowers really believe in their homes if they’re willing to make larger monthly mortgage payments while underwater. And if they stick with it, they’ll build home equity a lot faster than those who stick with the traditional route. Of course, one could argue that now is not the time to pay off your mortgage quicker, considering how low mortgage rates are at the moment. But still, homeowners who do will help the housing market recover faster. HARP refis were most popular in the sand states of Arizona, Florida, and Nevada, but well below average in high-priced California. In Nevada, 66% of refis last month went through HARP. The numbers were similarly high in Arizona (50%) and Florida (54%). In California, just 19% of total refinances were HARP loans. 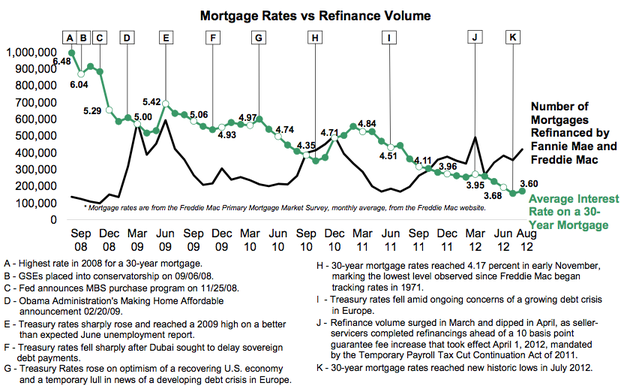 Read more: Are consumers even interested in low mortgage rates anymore?